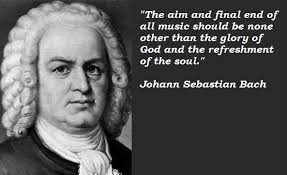 Happy 334th (Old Style) Bach! Johanna Sebastian Bach had 2 marriages which resulted in 20 children all up (his first wife died). There isn’t anybody young or old who when played price by Bach, cannot say it sounds familiar. And to think that his Baroque peers considered his compositions “old-fashioned” at the time. This is what timeless music is made of. The above quote is poetic. The comments I receive from family of loved ones in our care, regarding the music being played in the dining areas, are always positive ones. When classical music fills the living areas our elderly residents are uplifted, including most of the staff. After all, we are a depot that our sojourners are preparing for final departure from, and soon they will be refreshed from their lengthy journey…life on earth. Classical music is appropriate and appreciated. Gods glory be our goal.